Streamline strategic project planning efforts with real-time collaboration. An action plan provides a detailed outline of the tasks required to accomplish a goal. It breaks down the process into actionable steps based on a given timeline. This could apply to an employee who is trying to improve job performance, a project manager assigning action items to team members, or an organization or school implementing system-wide changes. No matter the end goal, an action plan offers a clear roadmap for how to get there. Action plans support efficiency by assigning a time frame to individual steps in the process. They also make it easy to track progress, keeping projects on schedule and on budget. And having a written plan of action provides accountability and a valuable reference tool. Creating a comprehensive action plan can help ensure that desired outcomes are met in the most timely and effective manner possible. 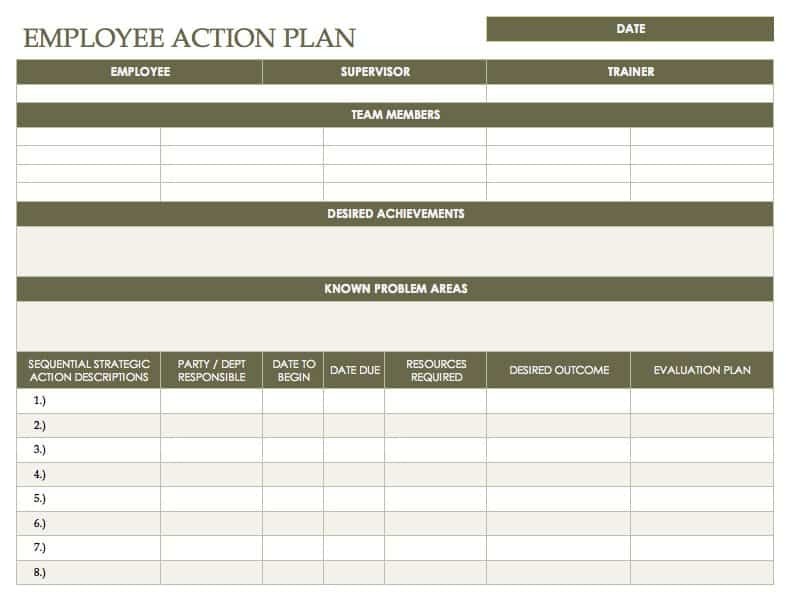 Included below you'll find multiple action plan templates in Excel, free to download and use. We've also provided customizable plan of action templates in Smartsheet, a collaborative, real-time work execution platform that empowers you to better plan, manage, and report on project initiatives. One of the benefits of using an action plan template is that the formatting is taken care of - you can simply edit the template to suit your needs. As you will see in the free templates listed below, multiple layouts are possible for an action plan. But regardless of the structure or content of your plan, here are some tips to keep in mind as you begin the planning process. Choose an appropriate goal and clearly define your objective. Take into consideration not only the importance of your goal, but also how reachable it is considering the time frame and resources you have to work with. Use a team to create your action plan. This won’t be appropriate in certain cases, but brainstorming with team members can help create a stronger plan of action. And in the course of creating a plan, you may find that you need input from others outside the team as well. Choose action steps that are concrete, measurable and attainable. These steps should be clearly defined, not vague ideas. Identify who is responsible for each action step and who will be supporting them. Support people are not responsible for the outcome of an action step, but they assist in the process. Provide a clear schedule for completing action steps. Your final goal may be a short-term project or take years to complete. It’s important to break down the timeline for each step along the way.List the resources necessary for accomplishing action steps. If sufficient resources are not currently available, include a plan for their acquisition. Review and update your action plan as it is implemented. As you track the progress of your plan, make any changes needed as they arise. Communicate with key people about the plan’s progress and effects as it is carried out. All of the templates below are printable, customizable and free to download. They are designed for Microsoft Excel or Word and can be saved in PDF format. Choose the template that best meets your needs and begin creating your action plan. 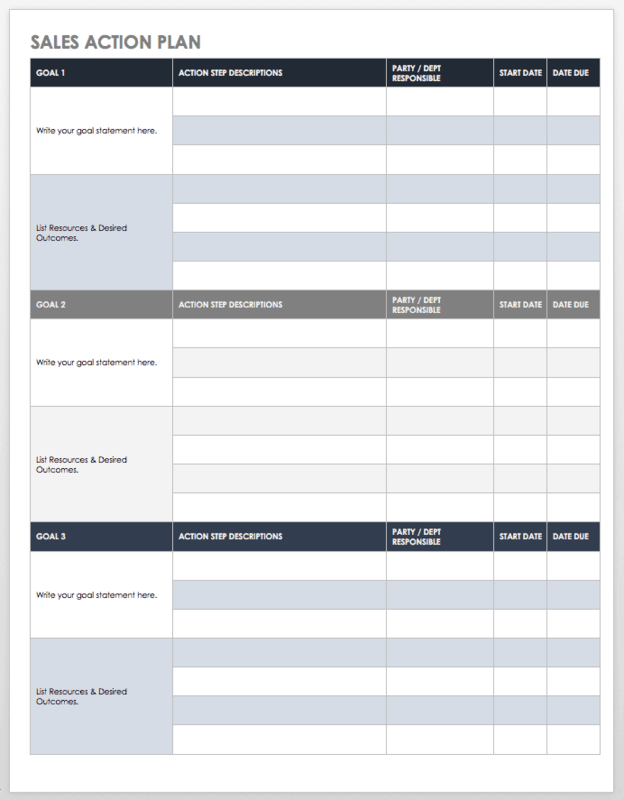 This action plan template provides sections for four goals, and more can be added. The goals are then broken down into action steps that can be assigned a priority and completion status for tracking progress. Starting and ending dates can be added for each action, and a column for notes is also included. This template would work well for project management, event planning, business goals and more. This free template focuses on action items, which are listed in the first column with additional space provided for detailed descriptions of each item. The timeline for each item is tracked with a starting date, due date and completion date. Other information for each action item includes priority, responsible party and status. This is a simple yet detailed template with extra room included for notes. 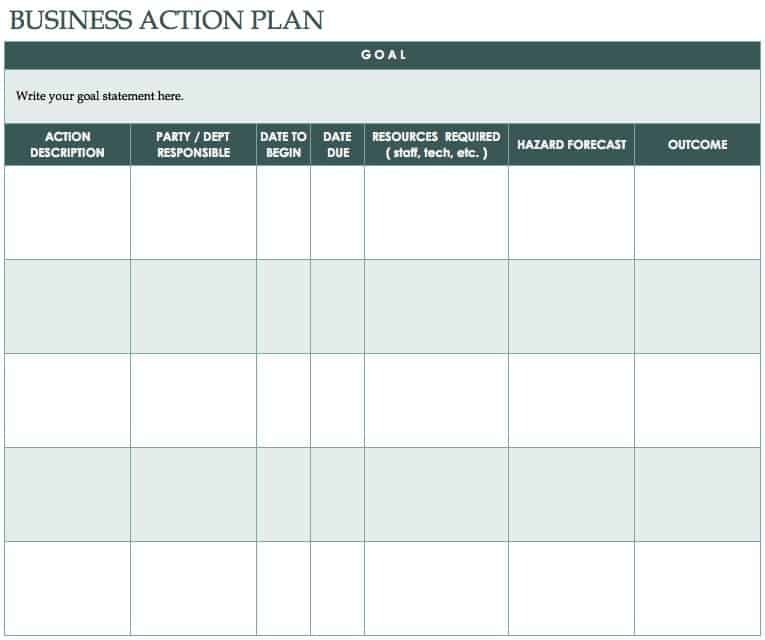 This action plan template can be used as a supporting tool to reach the goals in a business or marketing plan. The goal is clearly stated at the top of the template followed by action steps below. This template provides sections to record necessary resources, potential challenges and final results. The final result of an action item could simply be a successful completion, or new steps may have been identified in the process. An action plan may have to be adaptive in order to reach business goals. 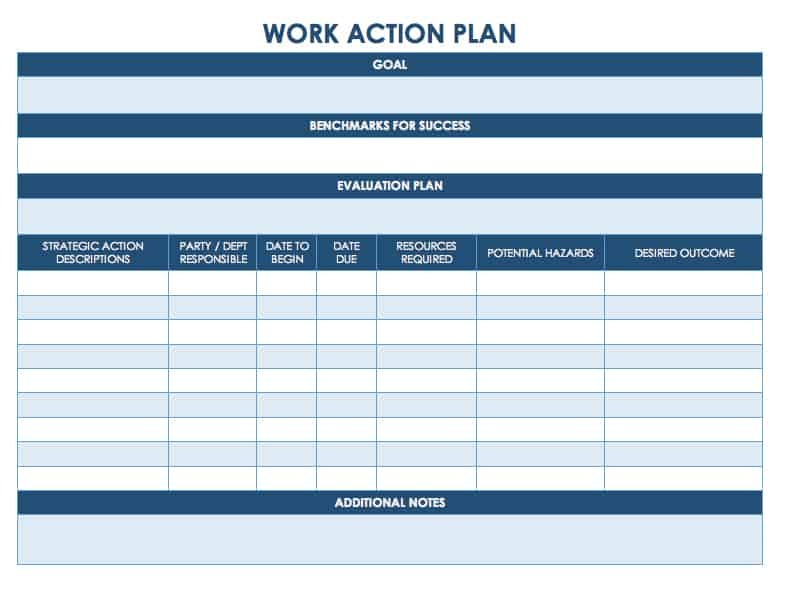 Keep your project on schedule and evaluate its progress with this project action plan template. 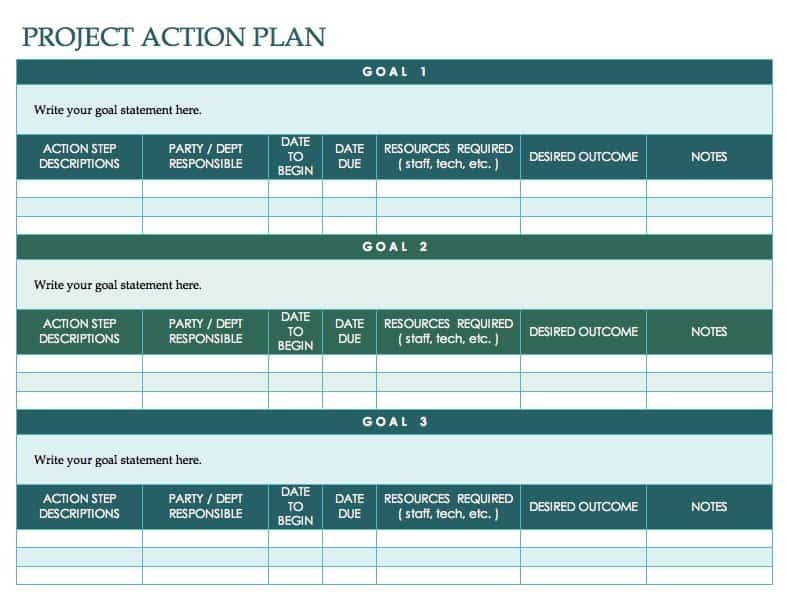 The template breaks down goals into separate sections along with their associated action steps. The timeline, expected outcome, ownership and evaluation methodology can be recorded for each action step. 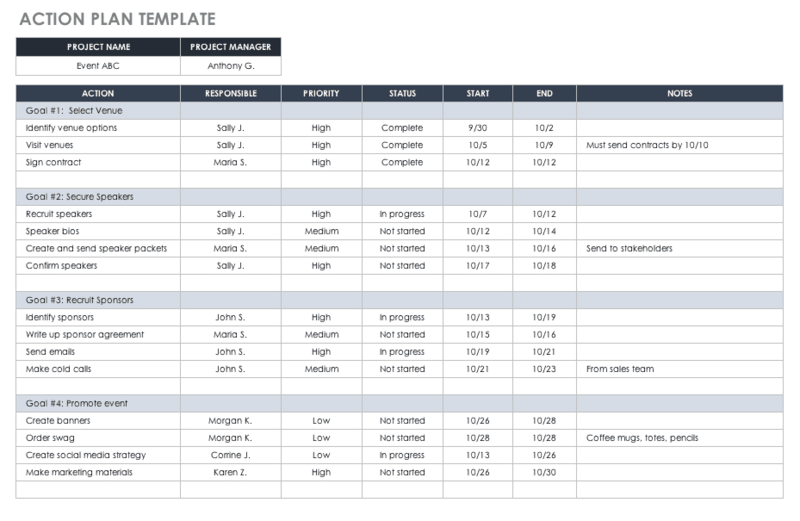 Save the project template as a PDF and print for easy sharing with a team. 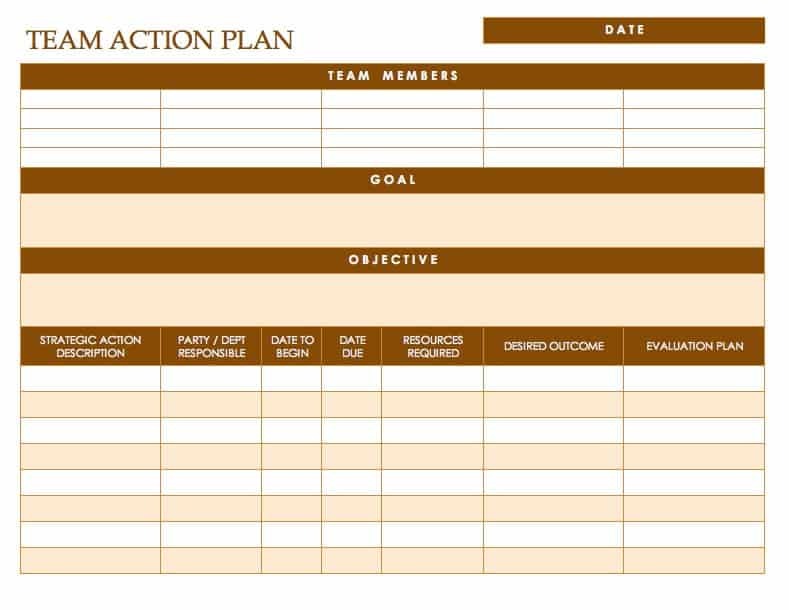 This team action plan template includes spaces for listing team members and tracking attendance at more than one planning session. The template includes the basic ingredients for creating a successful action plan, and a simple layout facilitates group process. Having a clear goal and objective stated at the top will help team members stay focused as they work together to create a plan of action. This is a detailed work plan template to help ensure success in your improvement efforts. The steps of the work plan are clearly outlined along with important data. What resources are available or needed? Where are there points of resistance that need to be dealt with? What is your communications plan for each step? Including all of these factors in your action plan will help implementation go smoothly. A corrective action plan aims to solve a specific problem or change a situation so that goals can be met. 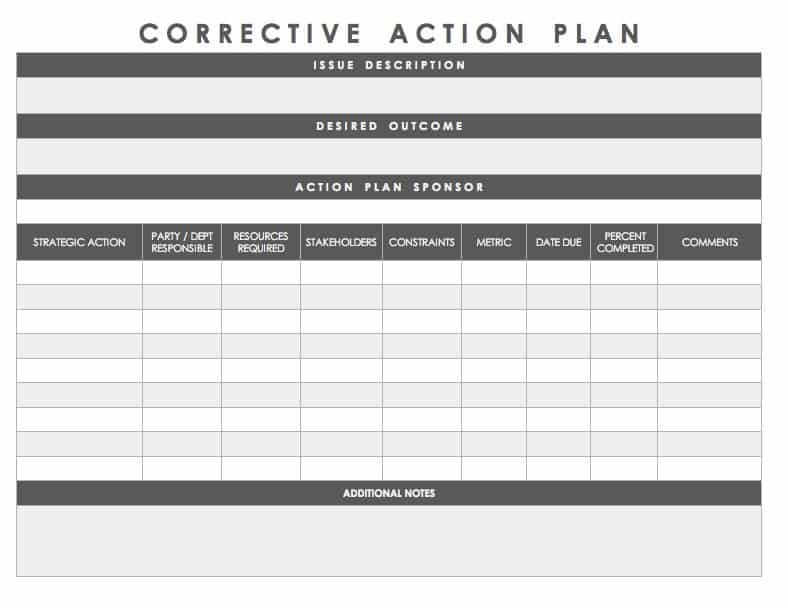 This corrective action plan template provides a simple layout with plenty of room for detail. Both the problem and desired outcome can be defined at the top, and the action plan includes important information such as stakeholders, constraints and metrics. This template can be easily adapted to a wide range of corrective plans. This template works well for an employee improvement action plan. Sections are provided for listing supervisors and support team members. The template is also formatted with multiple steps, so actions can be broken down into a very manageable sequence. This provides an organized way for employees to work toward specific achievements. 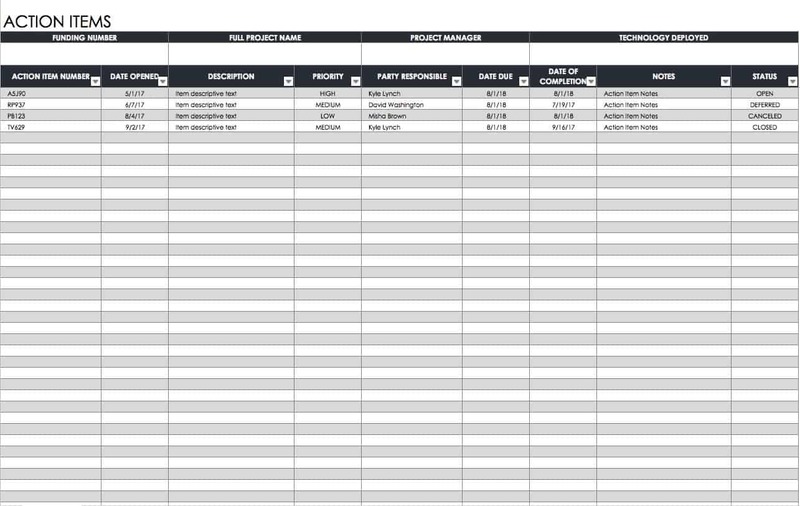 This sales plan template includes room for reviewing current and previous revenue, market and competitor analysis, sales goals, and a plan of action. Having all of this information in one template can help ensure you are addressing the right issues and setting achievable sales goals. The template can of course be edited to include whatever information is pertinent to your business. 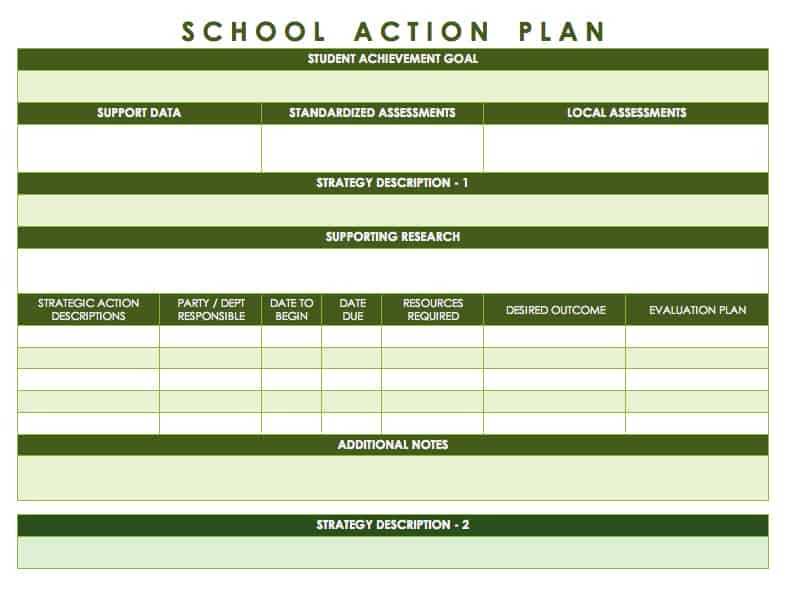 This action plan template was designed with school improvement in mind. It allows you to state a long-term goal, outline different approaches to reaching that goal, and create an action plan based on your chosen strategy. You can identify the budget, materials and time needed for each action step as well as the timeline for its completion and evidence of success. Tracking the success of each action step will help ensure that your school improvement efforts lead to your long-term goals. Having a detailed plan of action is the key to accomplishing your project goals. To ensure that you reach your outlined objectives on time and on budget, consider using a tool that enables you to plan, manage, and collaborate on tasks with your team, make updates in real-time, and share progress with multiple stakeholders. Use Smartsheet to streamline initiative and project planning, improve collaboration, and increase stakeholder confidence as you plan, evaluate, and share the components of your project. Stay up to date on status with automatic alerts and reports and dashboards that roll up details to help ensure your projects are delivered on time and on budget. Try Smartsheet to discover how you can maximize your project management efforts, today. Choose from 9 free strategic plan templates in Microsoft Excel and Word formats. Discover an easier, more collaborative way to create project plans. Smart and progressive documents for developing action plans for organisations. I personally find your documents very useful and helpful. Great job. Good day, I am across one of your templates that I would like to use for an assignment that I am doing on Team Leadership and Diversity in Projects. I would like to know if it is possible if i can use this template for the assignment?